I know what you are thinking if you are a coupon lover and swear by the savings but you can also chop your everyday food costs without coupons. Just like the header says, save by buying less and it’s true. People tend to overspend when grocery shopping for everyday food for a variety of reasons and we’re included in that group. We’ve since been working on keeping that at bay and it’s not so bad as long as you find your grocery shopping triggers. Using coupons, especially if you aren’t a pro at it takes time to organize every week so you must be willing to make that time in order to reap any rewards. Sure some weeks may be better than others but for those who simply don’t have the time you don’t need coupons to save money on groceries as long as you are smart with what you buy. We were heavily into using coupons during the years 2010-2012 until the big coupon rage took off and Extreme Couponing in the USA blew up the television screen. In that time more coupon bloggers joined the blogosphere which is now saturated with websites wanting to show you how to save money using coupons. Some of our favourite Canadian coupon websites have taught us lots about couponing in Canada and they still do for many of my fans. I’ve mentioned before that our stockpile is pretty large when it comes to health and beauty and laundry so we haven’t had to spend much in our budget over the past few years for such products. Just this morning we both said how little of a dent we’ve put in our massive stash but the food has dwindled down to very little. If you look at our coupon usage for 2014 you will see we have only saved upwards of $39.00 using coupons and we’ve just started to use the popular coupon apps to save a bit more when we can. Coupon apps for us are not like paper coupons rather added store savings as long as you are willing to put the effort into grabbing it. What we’re not doing these days is buying more than we need with coupons and we hardly if ever take that coupon binder with us. In an earlier post I talked about whether we eating too much food which is driving up the cost of our everyday food budget. Sure that may be one culprit but wanting to buy more than we can handle is also another. There used to be a time where we wouldn’t leave home without the coupon binder but lately we have had no need. Our grocery list stays pretty consistent each week and if a coupon comes up for products we use we will pack them in an envelope ready to go shopping. Otherwise we don’t bother because we simply don’t want to spend more money in our budget than we need to. That was a huge issue for us and although we did get many deals over the years there are plenty of products we can look back on and say we could have gone without. Just having a walk around our stockpile we see items that haven’t been opened and may never get opened. At the time it seemed like a great deal even if we still paid the taxes and likely a bit of money towards the product as not everything was free. We didn’t want to be that couple any more so we took the coupon usage down a notch. We used to buy taco kits, crackers and I can’t tell you how many boxes of cereal we had at any given time. Lots of the cereal went to the garbage or was donated because we just didn’t eat it on time. Looking back we didn’t need 10 taco kits or boxes of crackers or 100 cans of baked beans. Why? It’s simple, we still have food that has not yet expired but we will end up donating it as we can’t get through it all. Sure, donating is great but donate because you want to not because you have product you can’t get through. We really wanted to change our shopping and dietary habits so we felt better with our grocery budget and the way we chose to eat and spend our money. Coupons are still a great way to save but let’s pretend for a moment that coupons don’t exist or it’s rare to find coupons any longer. What other ways can you save money in your grocery budget? Don’t get me wrong we still use coupons but it’s not necessary to use them all the time to snag great deals. Many of you know that price matching is a super easy way to get the best prices utilizing the weekly flyers. Everyday food prices are competitive among the grocery stores so don’t forget to plan ahead and bring your flyers or smartphone with you to save money. If you have a computer or smart phone you can now use the popular savings apps which are not coupons per say, rather grocery savings without coupons like I mentioned above. The best part is these apps are increasing the number of fresh foods and produce that they showcase each week for those that sign up. We love that and any seasoned couponer knows that we never got the sheer amount of fresh produce savings with coupons as we can today with these apps. You don’t need to bring your coupons but you can still reap the rewards of saving money. Another way to save money on groceries is to grow your own vegetables. I’ve said it before and I’ll say it again, organic tastes better but if you plan to pay for it in the store be ready to pay some hefty prices. Although many people choose to eat organic they also stick to their budget buying only what they need eliminating all the “extras” just because there is a coupon attached to it. Just the other day I noticed on a Facebook Free Stuff group that a follower asked if anyone had any extra Rhubarb that they wouldn’t mind sharing. In just one hour she had 3 people offer her rhubarb from their gardens. I was amazed but not shocked. So, if you know what is in season don’t be shy to ask if anyone has anything they’d be willing to part with, especially if they can’t get through it all. In the past we’ve offered free fruit such as raspberries and apples online simply because we didn’t want to see it waste. Just this past week I helped my friend with some work in his backyard that he didn’t know how to do. I never charge my friends for things that seem simple to me so he offered me organic produce that he buys in bulk as payment. I couldn’t say no so we grilled up some lovely asparagus for dinner the next night. If you have some spare time on your hands local farmers are always on the hunt for help where the payment is free food. You get to pick free food from the land you help grow just for trading services. If you have a large piece of property you can let other green thumb gardens use your land to grow their garden. In return they can offer you free fresh organic produce but they do the work to grow it. Another way is if you have a large garden you can rent out your land to other growers and use that money to buy groceries which helps balance your grocery budget so you can use that money for other bills or debts you may have. You can also save more by visiting local farmers in your area or farmers markets where they love to haggle so keep that in the back of your head too. In the summer picking your own fresh from the garden such as fruits and vegetables are another super saver for everyday foods that normally plague the grocery budget. You might even notice sellers on Facebook or other social media with straight sell produce boxes from local area farmers. They will even deliver the produce right to your door for a small delivery fee. If there is something you don’t like in the box you can negotiate another product. We love pink stickers and reduced products because they still have life in the product but with it comes a giant grocery savings. If the store can make some money off the product they will do what they can rather than take a loss on it. This leads me to the top reason you don’t need coupons to save money for groceries and that’s because you are cooking homemade meals. Even though you can still use coupons to buy your canned food products and fresh products when they are not available ditching the pre-made foods for homemade soups, stews, casseroles (casa-roll-ehs! for all my What’s for Dinner fans) can really cut your budget. You can also stretch the budget by eating proper meal portions and bulking food out with plenty of beans and vegetables. If you have a freezer you can bulk cook as well to save money. Most often, we don’t need the snacks we think we do when fresh fruit and crisp vegetables will do the trick. Just yesterday Nicola shared a recipe for homemade granola bars which eliminates all the added ingredients that most people can’t pronounce, the need for coupons but keeps the pure bliss of home-baked goodness. My wife and I were looking over our grocery budget and noticed that we haven’t been doing too badly with sticking to our food plan. We buy the odd convenience type foods and canned good but for the most part we’ve managed to do it all without hardly using any coupons. All I can say is the reason behind this is everything I’ve listed above. If you find you use lots of coupons try for one month not to use them by eliminating all the foods you really don’t need to get because you have those coupons. Examples would be crackers, cookies, cakes, granola bars, chocolate bars and pre-made meals. Instead, focus on making homemade snacks or choosing better options. We also find with less of the products in the house that we used to buy just because we had coupons or thought we needed the product the less we reach out for them. Just last night we noticed Oreo cookies on sale for $1.77 at Canadian Tire. Sure that’s a great deal and no we don’t need them. If we want cookies that bad we can make them homemade but if we buy bags of cookies then we’ll likely pile through them with or without restraint. It’s always harder when they are in stock and an arms length away. Stock your pantry with healthy everyday food such as raisins and other dried fruits, variety of nuts and seeds, chipits, honey, granola, oats, dry chick peas and other delicious snacks. Sure, you may get lucky if you have a Bulk Barn coupon to use but even if they aren’t available by eliminating other items that you don’t need will make room to pay for these better options. Even the Bulk Barn has great deals if you shop around such as 25%-50% off products. If you are a bulk food shopper who likes to go to Costco keep in mind that not all bulk food is the best priced everyday food so do the math. My nephew never asks for crackers, cookies or other sweets. Instead he loves boiled carrots and for snacks he loves dried and fresh fruits and nuts alongside a big bowl of creamy yogurt. He gets no sugar infested juice, instead he gets milk or water as his beverages of choice. A treat comes once in a while but that’s what it’s meant for. So go ahead and buy a treat if you must have them in the house just don’t buy 10 kinds of treats. Don’t give up before you start and don’t say “you need it” because you probably don’t. What other ways can the fans save money on everyday food without using coupons? Share your shopping secrets in the comment section along with your grocery game shop of the week! If you missed any grocery game posts for the month I will post the line-up for the month each week here in this section for you. NEW!! You can now download the FREE Canadian Budget Binder Budget Spreadsheet in Excel…Grab it while you can… It’s FREE! We use it to budget and in large part a reason we were able to pay our mortgage off in 5 years, check it out! If you know a topic that should be discussed send me an email and let me know. Total Budget for June $235.00-$20.89=$225.49/4=$56.37 per week or $75.16 per week if we do 1 no-shop week. Weekly Overview: We didn’t need too much this week since we are trying to use up what we have in our freezer which includes tonnes of cut green peppers from last year as well as Swiss chard from the family garden. We also have bags of fruit that we bought 2 years ago although I’m not sure if we should just dump them into smoothies now. The fruit is still good but just another point of us using coupons to buy too much food because it was cheap with a coupon. We are hoping to get rid of our freezer and downsize to a medium freezer in the next couple of months. Did you find any coupons? If so share the details in the comment section of this post where you found it and what the coupon is for with expiry. 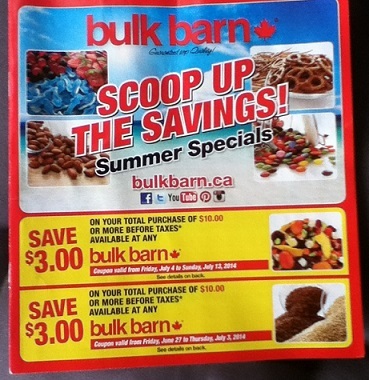 Summertime savings booklets are at the bulk food store so if you have a local Bulk Barn head on in for a coupon booklet before they are all gone. Do I have to be Canadian to post my Grocery Shop? : No, you don’t have to be Canadian to post your shops only to win a monthly prize. We have fans who post their grocery shop who live all over the world. When does the Grocery Game close each month? : The Grocery Game Challenge closes at midnight of the last Sunday of the last post for the month. You can post your shops all month-long. Does your Grocery Budget include health and beauty and laundry products? : Yes our Grocery Budget includes such items as shampoo, conditioner, laundry soap, fabric softener, dish soap etc. We don’t mind stockpiling items that won’t be affected by expiry dates or have long expiry dates but not so much food any more. It’s just one way to help cut your budget to save money. Where can I find Canadian Coupons? : Here are your latest Coupon Match-ups of the week and your weekly Checkout 51 offers from 25 Newspaper Inserts around Canada compliments of Save Big Live Better that you can use to help you save money in the Grocery Game Challenge. How Do I Know what stores accept coupons? : You can find all your store coupon policies here. If you are not sure it’s always best to call the store and ask. 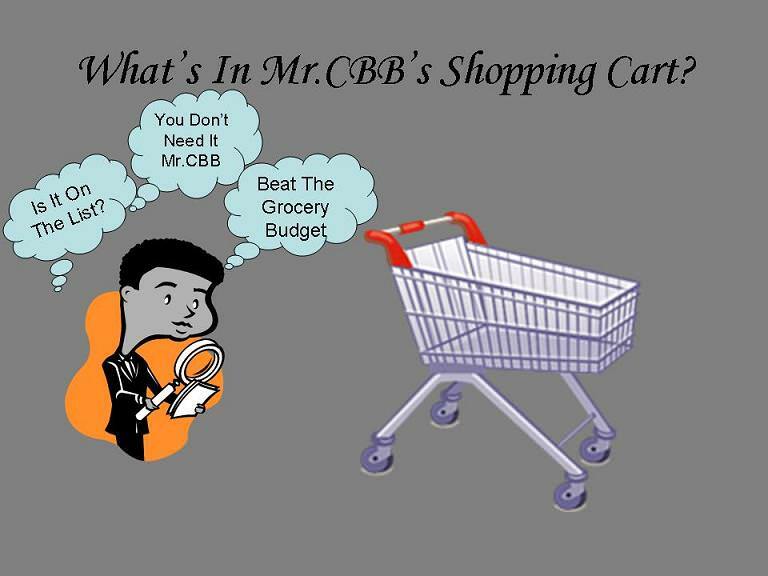 If you have just joined The Grocery Game Challenge 2014 get ready to dive deep into your grocery budget and learn just where you are spending, how much you are spending and what you are saving. Welcome to The Grocery Game Challenge Canada 2014! Can you picture yourself living the retired life? Dip those nibs in some chocolate 😉 now that is yummy!!! I love boursin cheese but will not pay regular price $6.99 and up for it! I love all the flavours they have. Hopefully they will go on sale soon. Our weekly budget is $125 making this month $500. You get ballot #27. My wife loves those Nibs. That Boursin cheese is very nice as well. We had it once when we found it with a pink sticker. A bunch of small shops this week and also small purchases to stay on track and maximize pc points. We were also trying to keep the meat purchases out of bounds this month as much as possible, but we were just craving something. The ground beef was made into 18 hamburgers, so some were frozen, and the rib steaks ended up frozen just to have at a later date. Good enough sales on them. The pop is more because we are drinking less coffee in the summer and caffeine is our one hang on for junk. It was a good sale, so multiple were purchased. I just wish hubby would slow down drinking it. Aside from that, we are loving having kale and arugula out of the garden and the farmer’s market is having other produce available. We love local as much as possible. Staying on track this month, but running low. I know it will be tight by the end. We find asian pears just crunchier and they are bigger in overall size, a more filling snack, but I never see these go on sale. Because we were staying so on track and having to pay full price that week for the other pears, we grabbed 2 as an attempt to convince our kiddo to try different types of pear. He’s been willing to try any until this one, I think wrapped individually because they bruise easy intimidated him (not to mention the packaging is part of the weight at the cash), but we finally convinced him and of course he loves them too! I’ve tried giving up the pop repeatedly and for some reason I can’t do it. We don’t drink the real sugar stuff, the low cal pop is what we have. Granted the aspartame is not great for our bodies, but the caffeine is really the big one. It’s been so hot for coffee, which is our usual. I do drink tea, but that’s just for fun, mainly the non-caffeinated stuff. We had backed off of the meat so much and been using freezer stuff, it just came to a point we were craving beef. Chicken is our main choice, especially since hubby is working on lowering his cholesterol. Beans are another big one. I do love sausages, but I find I can’t do a lot of pork personally, but the other two in the house can, so that tends to be our alternative. However, all meat right now is pricey, we’re just making it stretch! That’s great that you introduce him to new foods. I know some parents that don’t expand the food menu for kids and they grow up not liking fruits and veg etc and all they want is packaged foods. Both my wife and I our parents fed us everything fresh, homemade or from the garden and we ate it no problem at all. There were no options though.. eat it or starve. I had to quit the pop as it’s just not good for me. I have it once in a blue moon if we are out but I try not to buy it. It’s not easy. My sister in law she buys cases of the diet stuff and can’t go without it. We are like you as beef isn’t our first choice. You are right all meat is pricey. We eat as little as we have to but enough to satisfy us. Finally getting here, it’s been that kind of a couple of weeks!!! Besides picking some strawberries I was around town getting things at the local Guardian Drug Store and Canadian Tire as well as the usual Foodland. I used most of the stockpile budget for the month but I did manage to come in under for the week. I got almost three batches of jam fromthe berries and one big bowl for us to eat with the cake, ice cream and whipped cream.i was short a couple of cups of fruit for a third batch so I just froze what I had until I could get back to the farm. I have been going to Megan’s for a good number of years and always had nice berries and they are very nice to deal with. The berries are sold by weight and I was over the $20.00 but Andy rounded down and just called it the twenty bucks. No argument here. Getting the sugar at Canadian Tire was nice for the stockpile as was the extra lean ground beef at Foodland. The beef wasn’t all that great a price compared to what I have paid in the past but given how the prices of meat is going up so much I grabbed it. I still made it under for the week even with the strawberries and there is room left for more berries next week and still make it for the month. Here were coupons in the BD cheese slices too!! My daughter took one of the packs as the grandson loves cheese too. The whipping cream was a container…and the cake, clearly was store bought. Given all the berries to deal with I cut that corner. As i have managed to just get back into couponing a few months ago and having a bit of extra money each month i started a stockpile. (diapers, laundry soap, cleaning supplies etc). I dont coupon as much now as i am covered for some time. We definetly do a lot of home cooking to save on money and i love shopping later at night/early in the morning at certain stores when i know i can get those special50% off sticker items. I have started going back to the farmers market on the weekends to get my produce which looks and tastes great! I unfortunately live in a basement apartment so cant quite garden although my parents are moving this month to a new home 5 minutes down the road with a huge garden so will be given half for my family 🙂 Here is my shop for this week. I’ve really been trying to cut back and watch my spending as we are saving up for some other big purchases. I used my 255 carry over to purchase my daughters christmas present. (front row tickets to disney on ice frozen!) I would probably grow tomatoes and a whack of herbs as i love to cook with them. My mom already grows tomatoes, strawberries and herbs in her garden so they are constantly giving me a bunch which is why i hardly have to buy them. I think having a great garden would be a great opportunity for something fun to do with my six year old! I shop for 2 adults and a 3 ½ year old boy. Our budget is $85/week or $340 for this month and includes laundry, health/beauty, etc. Total Grocery Amount Budgeted For the Year: $4,420 ($85/week) + Meat order $172.85/month for 9 months $1555.65=$5975.65 for the year including the meat order. WOW, hook me up with your $5 Pillers coupon where did you get that bad boy? I don’t buy Pillers often but that is a great coupon. Oh, I didn’t know that Checkout51 and snapsaves both had Saran on. I”m sure that deal is gone now. Great deal on the cream cheese… I paid a bit more. I need to plan the shops better. Let’s see if you can make it this month. You might have to just take cash with you of what’s left and say that’s all I have. It’s hard but we’ve done it just to get back on track or as close to it as we can. 🙂 Happy shopping… well done. Mr.CBB You get ballot 14.
lol the $5 Pillers was from a complaint…they actually sent me four of them. I had a pack of meat that got black spots all over it before expiry. I sent them pictures. Great deal on Saran! Money maker! I take an hour or so every Friday to plan my shop by going through the flyers and then making a list in my phone of the item I’m purchasing and where to price match it and how much. Its a great app. I could never just take cash and say that’s all I have lol. I’m hoping that my grocery bill doesn’t go up too much higher now that I’ll be staying home with Adam plus babysitting my cousins daughter. Hubby went for a stroll thru the mall uptown and got some really nice deals using the coins in his pocket. I love my little “gift” from him… 6 tomatoes and 4 large onions. The man sure knows the way to my heart!!!! I had a coupon for a free 2L Skim milk if I spent $20 at Safeway. Even though this was going to take me over on the month, I decided to top up some “fresh” items and take advantage of a couple of sales. I didn’t get my asparagus or the free milk but I have rain checks for both of them!! But I did get 6 pints of raspberries for $12 since I didn’t buy the asparagus. I LOVE raspberries!!!! Woo hoo! Kin’s Market – Maple Ridge << Hubby's little "I love You" gift! TOTAL UNUSED RESERVES $650.00 … that is a $400.00 carry-forward from 2013 and $250.00 in NEW 2014 savings. So, if you look at the $1,702.52 calculation that we have spent in 2014 and subtract the $250.00 we have actually saved in our “reserves” and the $159.42 we have recorded as spent but is actually set aside for future USA grocery shopping… we have actually spent $1,293.10!! That is $153.10 over the $1,140.00 we budgeted for January through June. Fortunately we have 6 weeks of vacation time still coming in 2014 when I use our “vacation funds” instead of the “grocery budget”. And I am away for 3 weeks on top of that and minimal, if any, shopping will be done while I am out of town. That’s a dollar value of 9 weeks x $47.50 = $427.50 so that $153.10 will easily be absorbed and we’ll get back on track so long as I really watch the spending for the balance of the year! Actually, the green cabbage is for a corned beef supper with steamed cabbage, carrots, peppers, potatoes and onions on Saturday night. The red cabbage will be a cabbage-carrot-radish slaw for next week. There’s an Irish band playing an outdoor concert at the Fraser River Heritage park out in Mission (30 minutes away) next Wednesday night. I am planning my picnic basket of goodies for us to take with us to have while we listen to the free concert. We’ll have the slaw, Amish broccoli-cauliflower-carrot salad and some eggy potato salad with fresh dill, cottage cheese and baked beans. I have some nice Bento boxes that I use… so it doesn’t all run together. And what’s a picnic without a thermos of tea? As a life time couponer, I really hated the craze the last few years. Good coupons are getting hard to find and dollar value on them hardly make it worth collecting. I learned to save pennies with coupons when I was little, but my parents also taught me to only buy what I’m going to use. I have no interest in stuff I won’t use just because it was cheap. I stock up on cleaning supplies and I covet the fresh produce coupons like berries. And, I love the coupons in the U.S. since you can get much better coupons for healthier food like milk, eggs and yogurt that we are allowed to bring across the border. However, they have always been a small part of my savings and I don’t spend hours on it. I have never thought to check our farms locally for picking to earn produce to gain personal produce, I will keep that in mind. One other thing I would add that helps keep grocery costs down is to food plan. Buy only what you need after going through the fridge and pantry, when we started that about 5 years ago, we saved a bundle and wasted far less. Food in the garbage is a travesty in our home. Great article! I still use coupons for things like laundry products and TP. Best is if it’s on sale and I have a coupon. I started couponing a couple of years ago when hubby became sick and money got very tight, very fast. I have never been able to have those huge stockpiles of goodies like most as I just couldn’t afford to buy that much at one time.I think I have 2 good size packs of TP, 4-5 Body wash thanks to a sale last week, a couple each of shampoo and hair conditioner, 5 jugs of laundry detergent and 6 containers of dish soap. Not a huge stockpile by any means. It will keep us going for a little while. All these are things I refuse to pay full price for and watch the sales to keep us stocked on them. I’m trying t work away from as much processed foods as I can while still dealing with what people here will eat.I’ve been lucky the last few weeks with half price stickered meats, mostly sausage and ground meats. 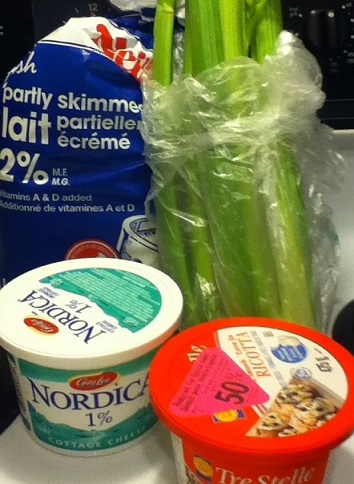 I run into town and shop No Frills when I can as they do have nice prices, especially compared to what I pay here. This week the strawberries are ready to pick so I was at the farm picking this morning. It wasn’t bad, I’ve seen better years and I’ve seen a lot worse.The local farmers market is up and running for the season now so I try to go every Saturday morning if I’m at home. A lot of the saving money with groceries tends to go back to the idea that you need to know your prices, then you know if it’s a good sale and how much to get for your home. The better the deal the more I try to get within the budget!! I would love to share your strawberry jam recipe and photos if you are interested in doing another recipe. I don’t think people need to have a massive stockpile and like you mention not everyone can afford to buy so much at once even if it is on sale. I do a little of everything you’ve listed! Except share my land as it’s not really an option. We don’t share our land either. lol There’s not even enough land for us let alone to share but I know some people with massive plots that could do just that. Thanks for all of the helpful tips! Love the idea of making snacks like cookies a treat rather than an everyday occurrence! The more snacks one has in the house the more they will get eaten. If you have one bag of cookies that’s the only option and when they are gone, they’re gone. You sure got some nice prices this week on the ricotta, cottage cheese and tuna! I use coupons but only for products that I had already planned to buy anyway. This week I have coupon for a free 2L carton of skim milk, IF I spend $20 at Safeway. Nice hook huh? Basically 10% off on your $20 order. BIG Whoopee! I was going to buy a jug of milk on Thursday anyway but other than that, I wasn’t going to shop this week. I am however low on a few “fresh” items so I will shop the required $20 including using a 2nd coupon to get my free milk. I am shopping “the loss leader sales” though so my $20 will go further than it normally would. 🙂 That FREE milk will carry us until we pick up a jug or two very cheaply in the US towards the end of the month when we are having a little get-away. I also load digital coupons on my cards for US shops and enjoy that method as I don’t have to haul a handful of paper coupons with me when I shop. I thought you might like the price of the tune. We were shocked to see it as I don’t think it was advertised. We may be over this month as well but not by too much. So, you’re going to load a suitcase. How many suitcases do you own Mary? I’ve never had gazpacho but I heard it was nice. I wish we had something like those digital coupons BUT I’m sure it’s only a matter of time. This is exactly why I’ve never used a ton of coupons in my life. Nearly all of them are for pricey, processed foods that we just don’t eat. I used to get some that you ordered online, that had soy milk coupons, those were nice. However, my usage patterns changed and now I just buy the shelf-stable tetra packs for the pantry, instead of the big 2L ones from the dairy section, so that they last longer and I don’t throw as much out. Plus, I know I always have some on hand, if I’m going to do some baking or similar. There have always been great food coupons available just not to the extent that coupon apps have the savings today. You are right the processed outweighed the fresh in the food department, I agree but they were still around. Now, the health and beauty, laundry and other coupons… well you can’t go wrong using them as long as you buy what you need. 🙂 Thanks for sharing your thoughts Anne!